The German High Speed Rail System traces the development of high speed rail technology in Germany, from beginnings in 1835 to the latest ICE system in 2008. 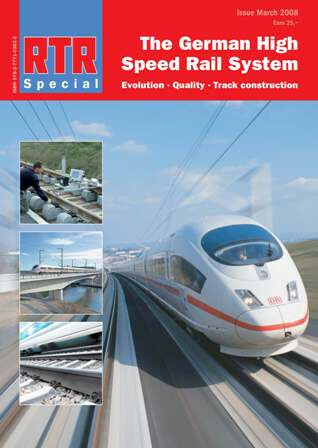 The construction of high speed routes for 300 km/h running brought about huge progress in the techniques of railway construction. Ballasted track, for so long the track type of choice, has been surpassed by ballastless track (slab track) for use in tunnels and high speed routes. A particular requirement is quality assurance: starting with the survey and design processes, it runs through the selection of materials and the accuracy and workmanship of the construction phase. Experience from a number of high-speed projects is set out in this publication.